There are few things more important in our lives than buildings. New buildings, old buildings, they make our world, they are a reflection of us as human beings. We live in them, work in them, shop in them and do practically everything else in them. We travel the world to see them. We look at them in awe, pay a fortune to view them stay in them. Often we hate them and complain about them. Personally, I love to draw them (see image above). The buildings people most appreciate are old buildings and not just the big, famous ones. So why are we knocking so many of them down? In summer 2016 several significant, arguably iconic Manchester buildings are to be destroyed. 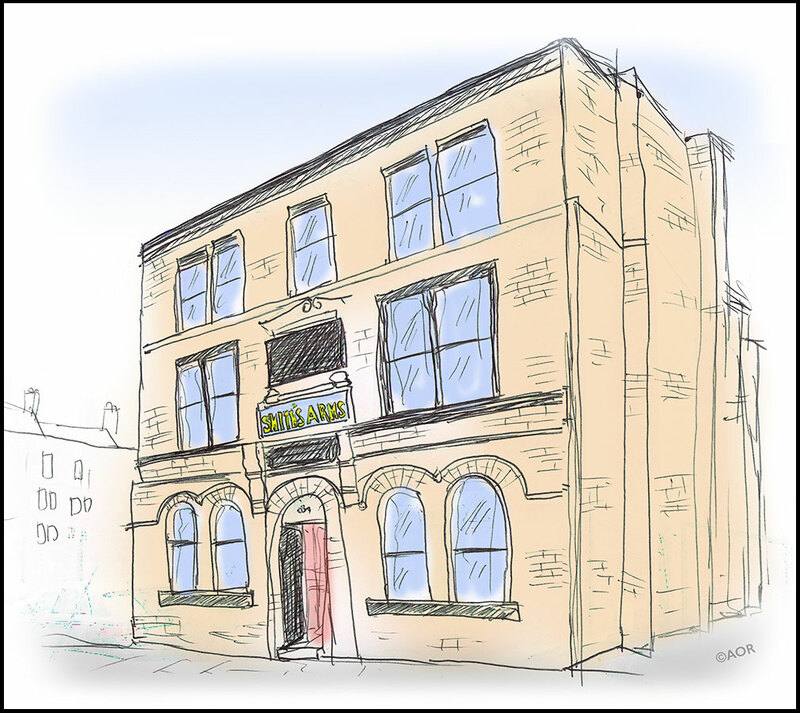 One of the most significant among them is a former pub, The Smiths Arms in Ancoats. It’s over 200 years old and predates many of the industrial buildings Ancoats is famous for. It was in use through the 19th and 20th centuries, surviving many upheavals, including the industrial revolution, war and industrial decline. Like many buildings in Ancoats, it’s been out of use but has great potential for reuse. All around are stunning examples of how old buildings can be given a new lease of life, most notably Halle St Peters, which stands next to it. Although run down due to neglect, the Smith’s Arms could still easily be restored. So why has Manchester City Council decided it must be demolished? For this article I am not interested in the design of the new development, its background, or the fact that it’s a consortium of Manchester City Council and a company based in Abu Dhabi, where I worked for four years. I am only interested in the building with its façade reminiscent of an age so different to our own. I can hear the hammers of the construction workers who put it up in the late 18th century, the proud owner welcoming customers, the echoes of the people who went in there down years. The Smiths Arms pub, Ancoats Manchester. Ornamental detail. I can see the changing scene around it, in time lapse, at first open spaces and then a growing number of factories and commercial buildings, then dwellings and places of worship. You can learn so much by focusing the bricks, the ornamentation, the typeface of “Smith’s Arms” lettering above the main door. And there is an additional aspect. The Smiths is the name of one of Manchester’s most famous bands, although to my knowledge they didn’t have any connection with the pub. The drummer of the Smiths, Mike Joyce, took part in protests to save the pub. Now let’s move from the past into the future and let’s assume that good sense will prevail and the building is saved. Scaffolding goes up, the builders get to work and when the covers come down there is a pristine building, unique, fashionable, a place to go and visit, hang out, contributing to the community spirit of the area. Inside much of it is new but there are some original features. It’s surrounded by a variety of other complimentary, a stimulating mix of old and new, quirky and imaginative. The new owners have made a connection with the name and there is a theme of ‘The Smiths’ inside, with photographs and memorabilia. It has become a magnet for fans of the Smiths. Now let’s explore the alternative scenario. Manchester City Council gets its way and building is destroyed. What’s there? Nothing. No bricks that have survived two centuries, no quirky designed lettering. It’s gone. It doesn’t exist. It never existed, or so it seems. And in its place? Concrete, or maybe glass or maybe those awful terracotta tiles that can be seen on numerous other buildings nearby. The Smith’s Arms and all its history, all the memories it contains, the associations it conjures up, has been destroyed to make way for an apartment building that may not last more than a few decades. One less reason to visit Ancoats and Manchester. That’s the reason why we must preserve old buildings, not just the big, Grade 1 listed buildings but also the smaller less noticeable ones, like the Smith’s Arms. Because they are rich in memories and associations, because they have a power to fascinate, and that’s what most people like, both residents and visitors. Because they look good and add interest and quirkiness to the street scene. Because they are better than anything that present day architecture can build. And so to answer my question above, why did Manchester City Council decide it had to be demolished? I believe that the people taking the decisions don’t fully appreciate old buildings. They move within the corridors of city-based power, less visible and accountable than at the national level. The council is constantly short of money and is always looking for any means to increase its income. A crumbling old pub is just a minor barrier to be removed, and the people campaigning for it to be saved are standing in the way of progress, causing the inconvenience and expense. If the Smith’s Arms is destroyed, Manchester City Council will in my opinion have committed yet another act of civic vandalism against the city it is supposed to be caring for. People will complain about it in strong words. They will become further alienated from local democracy and how we rebuild and renew our cities.The damage will be irreversible and yet another piece of the mosaic of Manchester will have been ripped out.